But who is that with him? What??? 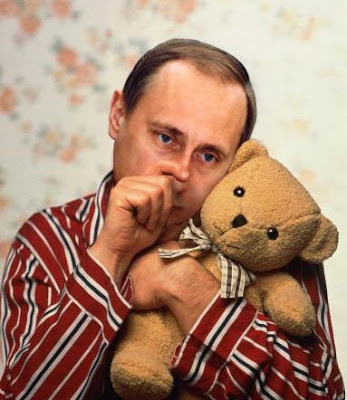 How would he gotten hold of *your* teddy bear? I was thinking it might be Дмитрий Анатольевич. This obviously will require further inquiry. If your Sputnik really is with Comrade P., then this is hardly the end of the story, I'm sure. I suppose we'd better not discuss what you & S. are really up to, though, as apparently one of Putin's operatives, Comrade Dilorenzo, occasionally monitors this blog.